I don't quite know where September went this year, but it seems to be over and that means that Vegan Mofo has started! I not only wanted to blog about vegan food, but also wanted to try to be vegan for the month. I'm sad to tell you that I have already failed. There's a lady (we call her biscuit lady) who always leaves us a packet of biscuits after she shops in Lush. Well, today she came in and left us chocolate biscuits and without even thinking I ate two. I am rubbish. So I decided I should make up for it by making an awesome vegan meal. I'd seen vegan pulled pork online and was intrigued by how realistic it looked and how good it sounded. So I popped to my local asian supermarket and brought some jackfruit, it then sat in my cupboard for well over a month until I decided to finally use it. It looks a bit weird, but after you've chopped the solid insidey bit off, it leaves you with a non flavoured stringy 'meat' which you can turn in to pulled pork! I chose the lazy mans route and used ready made BBQ marinade and seasoning, because I feel like being lazy today. It still turned out great, full of flavour and melt in the mouth. Both of my brothers even wanted to eat it which is saying something because they are both massive meat eaters. Start by preparing the jackfruit, remove from the can and cut the hard bits off from the inside of the chunks and discard. Then rinse the jackfruit in a sieve under some water and pull the chunks apart with your hands, drain well and leave to one side. Heat the oil in a sauce pan, then add the onion and fry for around 10 minutes. Add the garlic and fry for a further minute, then tip in the jackfruit and the BBQ seasoning in and fry for another 5 minutes. Add the BBQ marinade and water and simmer for around 30 minutes stirring occasionally until the jackfruit is lovely and soft. 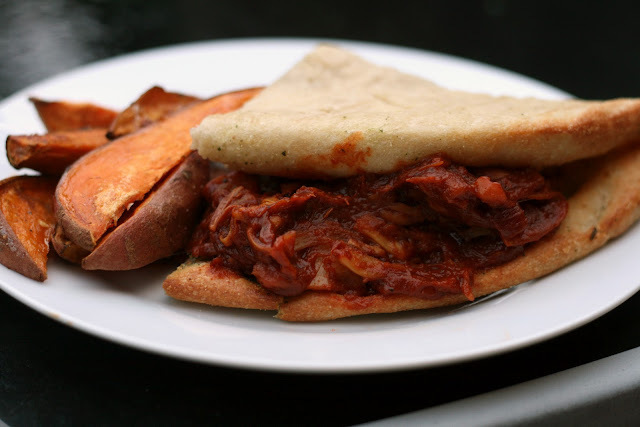 When it's done, transfer the 'pork' on to your flatbread and fold up, serve it with wedges and vegan slaw (I wanted to make some but Morrisons had run out of carrots!) and enjoy! !